Featuring a formidable list of writers, and encapsulating the eclectic range of art that has delighted and inspired audiences throughout Hayward Gallery's history, Fifty Years of Great Art Writing ranges from painting and photography to sculpture, choreography and architecture, and takes in a huge diversity of subjects, from Paul Klee to the art of the Harlem Renaissance, from David Shrigley's drawings to David Hockney's photographs, from Francis Bacon's take on the human body to Africa Remix, from Pipilotti Rist's installations to Afro-Asian artists in postwar Britain. 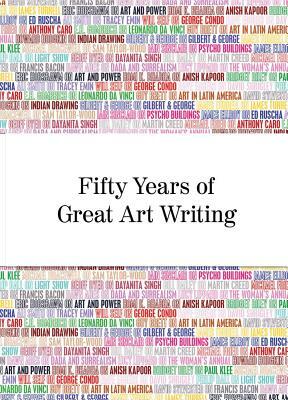 With intriguing combinations and connections between artists and writers, the book presents seminal essays that will appeal to art enthusiasts and students alike. Texts include Leon Kossoff on Frank Auerbach, Ali Smith on Tracey Emin, Dore Ashton on Agnes Martin, Will Self on George Condo, Geoff Dyer on Dayanita Singh, Adrian Forty on Le Corbusier and Stuart Hall on Jeremy Deller.